This car seat was manufactured in 2015. We bought 3 of these seats because we traded a vehicle in and got a smaller car. Our previous car seats no longer fit 3 across in the back of the new car so we had to research seats fast to find one that would. These did not disappoint! The material is a nice micro-suede texture. The seats themselves are very heavy but solid. There is plenty of room between the seats in the back of the car now. The bottom area of the seat expands if you have space to do so. I wasn't sure about the color right away from the picture but it is a little more camel color than this light looking beige in the picture. Overall, I love it. This car seat is slimmer than any other car seat Iâ€™ve seen, which is what we were looking for! This car seat has been amazing for us! An absolute lifesaver when we needed to fit 3 car seats across in our RAV4! Great car seat. High quality and super sturdy. Works well for needing to fit 3 car seats in a row. Wonderful Seat and fast sevice. Great Seat! Glad we finally took the financial plunge. Had been doing a lot of research on convertible car seats for our 18mth old son. We already have a Britax, which we love, but needed something for our second car and for air travel. Although Diono Radian is heavy at 29lbs, it folds up flat and can be attached to a wheeled carry-on suitcase, making it a breeze to navigate the airport. Plus, the install is quicker than with the cheaper "travel car seats" that every blog suggests getting. We tried those seat priced under $50 and had a terrible time installing rear-facing; forward-facing is much easier, but we are still at the stage of rear-facing in a vehicle. We really like the fact that we won't need to purchase another seat until our son is riding in the back without a seat at all. NO TAX and quick shipment. Thanks! We needed 4 of these car seats, triplets and cousin that is with us every day. First, but not most important, This was the best price I could find for these seats. The material is comfortable, they were moderately easy to install (compared to other car seats we've used) The triplets are getting older and I love the roominess of these seats. I actually sat in one (while it was on my couch) and I was impressed with the room and comfort. ProsHeavy duty - built to last. ConsI haven't com across any so far. Love these car seats. Had to replace 3 due to car accident. Thankfully the children were not in them but I will return to Albee Baby if I need any more. Fast shipping and good customer service. My daughter asked for another Diono Radian R100 for her 3rd baby. Now she has 3 lined up in her backseat. She said this one is the best one yet! Very sturdy and fits 3 across nicely in my mid sized vehicle. It is a little challenging to change the car seats between cars so we mostly keep them to one vehicle. This seat is sturdy, heavy, and complicated to install (if rearfacing). That said, it accomplished the goal of fitting between a Keyfit 30 and a Nextfit in the backseat of a very small SUV. Great well made car seat. Super open and easy to get in and out of. It is also super narrow, so it makes it easy to get three kids across the back seat. Love it so much we have 6! These are by far my favorite car seats. We have 3 boys and have 6 Dinoâ€™s. They are great for airplanes too! Very heavy, but soild is good and so far sleeping has been fine, that was a worry. Over all love it so far. ProsSoild seat. Pretty easy to install. Love that everything has a place to be stored. Thin. ConsVery heavy, so not a seat to be changed. No place in the fabic to install the cup holder. Though the seat itself has what looks like a place to place the cup holder. This carseat is compact and a great deal. Its a nice seat and its perfect to fit with up to 3 in the backseat of my car. Just what I needed. Can fit three in a row with room to spare! 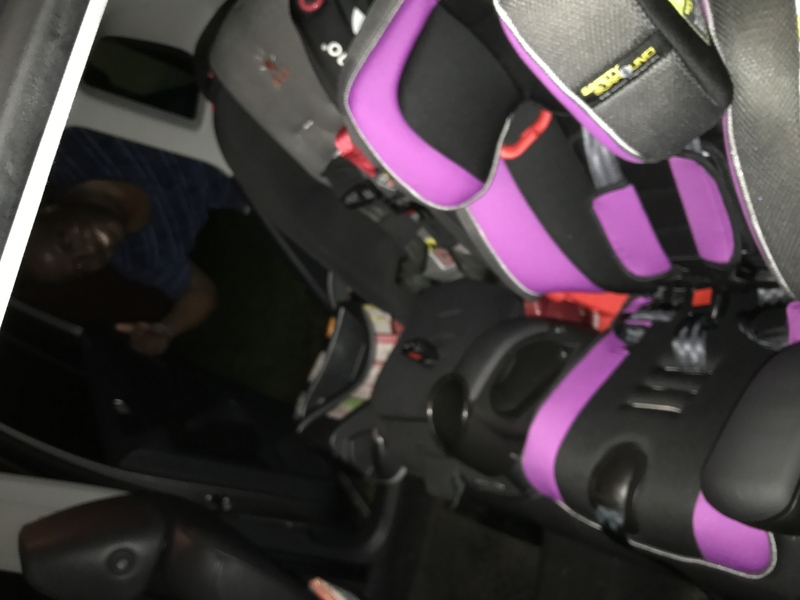 We have five kids under the age of ten and needed a slimmer fitting car seat to be able to use the third row in our Honda Pilot. These seats work perfectly, they give room for kids to slide past one another as they are so low profile and are easy to fit side by side using the latch system. Very heavy, but fold down for easy storage or travel. I like the fact that they are so heavy, they seem very sturdy and safe. My 4 year old who often falls asleep in the car is comfortable and enjoys her seat. The fabric is soft and easily cleaned. We have only good things to say about these seats. Great way to fit 3 across in a small car. This was our only solution to fitting 3 seats across a pontiac grand am. Pros3 year old said it is very comfortable. I bought this seat for my 5 year old since I am reluctant to take him out of the five point harness. It fit him perfectly, and was surprisingly easy to install. (I did watch a ton of install videos). He is very comfortable in the seat, and it fit well in my backseat with a booster and a rear-facing car seat. I should note that AlbeeBaby shipped on the same day that I ordered and I received my order quite quickly. Great car seat. My 4yo loves it and says it's super comfortable. It's the slimmest seat I have found so far, definitely slimmer that the Graco slim fit. The price on Albee baby was a bargain. ProsDoesn't take up much space forward facing. Nice padding. ConsVery tall car seat and did not fit in my car rear facing. Looks like it would only fit rear facing in a minivan or suv. We purchased this car seat specifically for its stellar safety reviews as well as its narrow build! We shopped around and were very happy with Albee Baby's pricing! The only feedback my husband (the car seat installer had) was how heavy it is. But, as it will simply be in one car the weight of the seat isn't a deal breaker for us!Make sure you also purchase the Diono Angle Adjuster as it does make a huge difference in space as my daughter is still rear facing! These seats are very narrow which is great. We have two side by side now in my GL450. They are SUPER HEAVY though. So if you are looking for something to take in and out of your car a lot this may not be the seat for you. This is our 6th diono for our 3rd baby. All three of our kids love these seats, I love that they fit three in a row in my suv and my husband's truck. This version is much nicer than our 6 year Olds they have definitely made much needed improvements. We have three grandchildren, so I bought this car seat because it was narrow enough to fit in the middle of a bench seat. Like many cars, the middle position has a tether strap but no latch anchors. Huge amount of effort went into trying to secure it with the seat belt. Tried to use the H bracket, but that did not help. There is just no way to get the belt tight enough to hold the seat in place. Also, by the time the belt is tight, the shoulder belt is pulling the seat up at an angle. To be fair, it does work well when you can use the latch anchors. Love this car seat! Diono is one of my favorite brands and I recommend it to everyone! Love Diono and love this color! This is our fourth Diono seat. We buy them because of their incredible safety features and ratings and also because we have four kids in car seats so we need to maximize our space and these seats are perfect for that. This is our first cobalt blue seat and I absolutely love the color. Best UsesIf you need to fit 3 car seats in one row, you need Diono seats! Works and looks just as described/ expected. Diono sends a great install and information book with the seat that is greatly appreciated. Emailed questions to Albee Baby prior to purchasing and they were answered quickly. Thank you! Purchased for the Grands X2 and with the reviews and seeing the inner safety features has to make this one of if not the safest protective child devices for transportation today. After looking at the amount of plastic which goes into others this one left me no choice but to do what I could to protect my Grands. Price is always what we look at and Albee by far had the lowest price from the many others searched online for the identical product and getting them in 2 days really surprised me. ProsManufactured with metal and not all plastic. And removal of the cover for washing after grubby dirty hands with various foods to behold will be all over them for sure. Will have to see about durability. Fits 3 in the vehicle if needed. ConsNot quite sure of any at this time. Daughter loves them for her babies. Best UsesAs previously stated having he dimensions to fit 3 safely will come in handy for #3 which comes later. We have had the car seat for about two weeks. 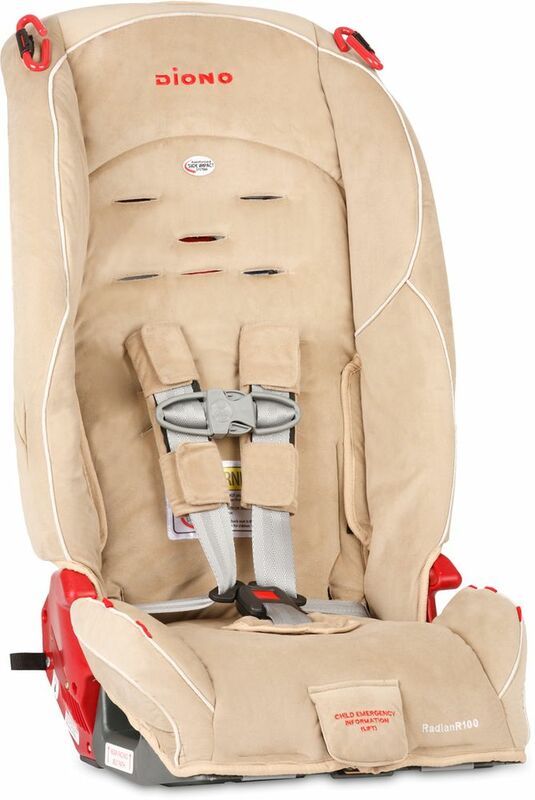 So far we really love it We picked this car seat because its safety reviews and its slimness. We're able to put it in the middle seat next to the infant car seat in our Ford Flex and still able to pull down the empty seat to access the third row. ProsWell made, only 17" at it's widest so it easily fits in the middle seat. ConsDoesn't come with cup holder, infant insert or angle adjuster. All have to be purchased separately. This seat is great! We bought two for our 3 and 5 year olds! I love that it narrow enough that we can fit 3 across in our 3rd Row! I bought one of these because I've been hearing so many good things about Diono. I went away from another brand that I love and was very disappointed. The seat is not very comfortable, the cup holder is very hard to get in the hole, and my kid can unbuckle this seat much easier than the chicco, which is dangerous. The buckle also feels cheaply made. I will never be buying Diono again, and I'm getting rid of the one I wasted money on. We absolutely love the car seat and feel very safe with our child riding in it. We love the steel framing and the upright seating. We love our Diono car seat! I love the steel frame, skinny profile, extended rear-facing, high-back booster, grippy shoulder pads, etc. just the best! So far, so good! We have two other older car seats that are Diono brand, but this one is a little easier to buckle, so that is a plus. Hopefully it will work well for several years. Purchase this to replace our old britax seat, this seat is definitely narrower and give us more space in the rear seating. This car seat makes our old ones look like junk. it has a solid frame but is very narrow for the three across option we needed. Material is really nice. Only drawback is the booster cushion that sits on top of the seat makes the bottom buckle very short/close to the legs. We also took our first 4 hour car trip over the weekend and the kids said their bottoms hurt, but hey, so did mine! I fit three of these across in my hatchback. First of all, I love that this seat is SOLID! Other car seats we've tried feel flimsy, light, and cheap. Not a Diono. I feel peace of mind that my children are in the best seat money can buy. We bought the Radian for my 3 year old and passed his old Pacifica down to his baby sister. We opted for the Radian because he was old enough to have head strength while napping and didn't need the extra cushion inserts and head support that a baby would. Notable differences include that the Radian only has one cupholder slot on each side, as opposed to 2. We can only use one side since the door is in the way so this only leaves him with one cupholder to share with snacks, cups, and trains. There is significantly less cushioning in the Radian but it doesn't seem to bother my toddler at all. We love everything else about the seat. At a lower price point than the rest of the Diono Family, I would highly recommend it for older toddlers and kids, and not as excited about using it for a baby. - Note: we have only done forward facing in this seat, but it has similar dimensions to our Pacifica. The Pacifica rear faces we'll but leaves the front passenger with little leg room. First of all, I love that this seat is SOLID! Other car seats we've tried feel flimsy, light, and cheap. Not a Diono. I feel peace of mind that my children are in the best seat money can buy. We bought the Radian for my 3 year old and passed his old Pacifica down to his baby sister. We opted for the Radian because he was old enough to have head strength while napping and didn't need the extra cushion inserts and head support that a baby would. Notable differences include that the Radian only has one cupholder slot on each side, as opposed to 2. We can only use one side since the door is in the way so this only leaves him with one cupholder to share with snacks, cups, and trains. There is significantly less cushioning in the Radian but it doesn't seem to bother my toddler at all. We love everything else about the seat. At a lower price point than the rest of the Diono Family, I would highly recommend it for older toddlers and kids, and not as excited about using it for a baby. - Note: we have only done forward facing in this seat, but it has similar dimensions to our Pacifica. The Pacifica rear faces we'll but leaves the front passenger with little leg room. We like these seats because of their narrow profile and how they convert to booster seats. Fits the smallest cars. Very comfortable for grandkids. Not only can 3 of these fit easily in the back of my VW Jetta, they look nice and the kids say they are comfortable. I recommend them. ProsNarrow seat width. Comfortable. Attractive. Easy to install. Folds to carry on planes. ConsHeavy due to steel construction. Not really an issue. Best UsesFits 3 easily in back of small cars with 3 kids. Very happy with price, quality, & quick delivery! Love love love our new diono !!! Super easy to install! Very slim and my little one loves it! Folds flat for storage and travel, and FAA certified for aircraft use! The Diono car seat cover is machine washable and dryable. The RadianR100 is a highly versatile car seat that could be the only seat you’ll ever need. It comfortably seats rear-facing children from 5-40 lbs, forward-facing children from 20-65 lbs in 5-point harness, then converts to a booster for children up to 100 lbs. Built for strength and safety, the RadianR100 has a steel alloy frame, reinforced sidewalls, SafeStop® energy absorbing harness, thick EPS foam panels for side impact protection and our unique SuperLATCH system for easy installation. The RadianR100 is NCAP crash tested, the industry benchmark for verifying child seat performance in severe accident conditions, and rated for LATCH use with a child up to 65 lbs. The R100 sits low on a vehicle seat for easy child boarding and with expandable sides and a longer seat bottom there plenty of room and comfort for your growing child. Option to add up to 4 cup holders (sold separately). It also folds flat for travel and storage, has a 10 year life, and offers amazing safety, comfort and convenience your child won’t outgrow.